As we've already told you, Samsung has taken the Samsung Galaxy S II, tossed in an updated build of Android, some new features from the Samsung Galaxy S III, and called the phone the Samsung Galaxy S II Plus. The phone has just launched in Taiwan as the GT-I9105 vs. the GT-I9100 for the original model. Android 4.1.2 is driving the handset which comes with the Nature UX UI. This adds Pop Up Play, allowing you to watch video over other tasks, and Smart Stay. This feature uses the front-facing camera to check to see if you are still awake so that the screen stays on until you fall asleep. 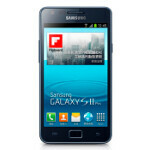 The Samsung Galaxy S II Plus is priced at 13,900 TWD or about $474 USD. 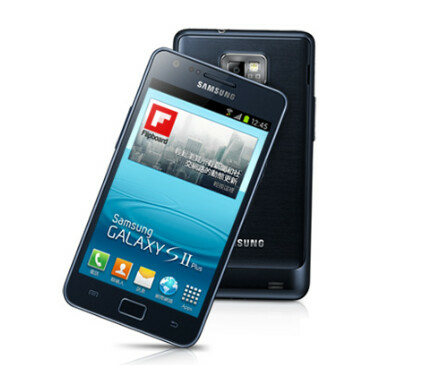 Samsung has released the blue model now with the white version coming next month. Right now, the device is available just in Taiwan, but we'd be surprised if it isn't rolled out to other countries shortly. The handset is equipped with a 4.3 inch Super AMOLED Plus display, and with WVGA resolution, the pixel density works out to 217ppi. A dual-core 1.2GHz Broadcom processor is under the hood and 1GB of RAM is on board. The phone comes with 8GB of native storage that can be expanded with the 64GB capacity microSD slot and it is all powered with a 1650mAh cell. Around back, you'll find the 8MP camera that captures video in 1080p at 30fps, and in front is the 2MP shooter for self-portraits and video chats. Before somebody comments 'LOL THAT'S TOO EXPENSIVE NO ONE'S GOING TO BUY IT! ', a reminder that iPhone 5 costs 21,900 TWD in Taiwan which is roughly $750 USD. Yes,but iPhone 5 is far better than S2 bro. Very nice! By the way, I thought the battery capacity for S2 Plus was upped to 1750mAh. How is this any different from the original S2 besides the software? Different CPU manufacturer is the only hardware change?